You have to think about one shot. One shot is what it's all about. A deer's gotta be taken with one shot. In the late 1960s, Rusyn-American steel workers Michael, Steven, Nick, Stanley, John, and Axel are preparing for two rites of passage: marriage and military service. Mike, Steven, and Nick are reporting to the U.S. Army and headed to fight the war in Vietnam. Steven is marrying the day before he ships out; all the friends except for Steven go on a last deer hunting trip. The first act depicts their life at work, at home, at the bar, and at church. Steven is marrying Angela in a stately shotgun wedding. Afterwards, the bride and bridegroom exit the church to the strains of Mnohaja lita to a wild reception with drunken singing and dancing to Ukrainian and Russian traditional music in the local VFW hall. In the upstairs saloon of the hall, away from the celebration, a deranged United States Army Special Forces sergeant, returned from Vietnam, is drinking heavily and unresponsive to questions about the war; an eerie foreshadow upon the friends. After almost provoking a fistfight with the sergeant, Mike drunkenly streaks through the neighbourhood; catching up with him, Nick makes him promise to not abandon him in Vietnam. Next day, on the final pre-war hunt, Mike, the community's best deer hunter, berates Stanley for being unprepared and forgetting his boots. 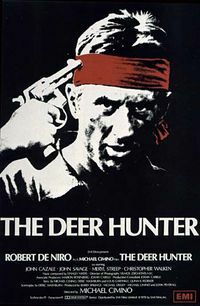 The Deer Hunter, Mike, kills his prey and mounts it as trophy atop the hood of his 1959 Cadillac car. After the hunt, on the night before the comrades leave for war. The second act depicts their infantry combat in Vietnam; Mike, a special forces sergeant, fortuitously encounters Steven and Nick shortly after they disembark from an infantry helicopter assault on a village. Shortly before that, Mike, the lone survivor of his ambushed green beret unit, had incinerated with a flamethrower a North vietnamese scout who had just killed villagers hiding in a spider hole. The three comrades' battlefield reunion is brief; the NVA are attacking to capture the pro-American village; mortar explosions end the reunion. The NVA capture and deliver them to the local Viet Cong. In a riverside prisoner of war camp, they are among several US Army prisoners. For entertainment, the guards force their prisoners to play Russian roulette and gamble on the outcome. All three are forced to play; Steven aims the gun above his head, grazing himself with the bullet and is punished by incarceration to an underwater cage. Believing Steven broken, Mike considers abandoning him. Nick angrily rejects Mike's consideration. Nick and Mike play each other. To engineer their escape, Mike bluffs the drunken jailors into allowing them three bullets in their revolver. The captors are elated by the American's seeming insanity, and increase their wagers. Mike and Nick each survive a round despite the revolver's three bullets. On Mike's second turn, he quickly shoots and kills the tormenting head jailor; they then overpower, disarm, and kill the other jailors with their own weapons. After rescuing Steve and escaping downriver on a floating tree, an American helicopter rescues them, but only Nick boards; the weak Steven falls to the river; Mike follows him in rescue. Steve breaks his legs in the fall; Mike carries him to friendly lines. The psychologically devastated Nick recuperates in a military hospital in Saigon. Afterwards, he aimlessly searches for Mike in the red light district. After an aborted tryst with a prostitute, Nick encounters Julién Grinda, a champagne-drinking Frenchman outside a gambling den where men play Russian roulette for money. Grinda entices Nick to participate, then leads him in to the den. Unbeknownst to Nick, Mike is in the crowd, as a gambler. Though Mike sees Nick, they do not reunite. Angered by the false machismo of the non-warrior, Nick calls the bluff of the rigged game, spoils the gambling, and is ejected from the den. After fighting with the bouncer, the American and the Frenchman are chased from the den to Grinda's sports car. Nick tosses money into the air, stopping the pursuing angry crowd. From amongst the crowd, Mike calls to Nick, but the noisy crowd drowns out his voice. Back in the U.S., a welcome home party is planned for Mike, but he tells the cab driver to continue down the highway, passing the house. Mike spends the night in a motel and chooses to return to the house the next morning when Nick's girlfriend, Linda is alone. Mike eventually becomes romantically involved with Linda. Although Nick and Steven are still missing, Mike, Stanley, John and Axel go on a hunting trip. Mike gets the opportunity to kill a beautiful buck, but aims away at the last second, unable to follow through with another killing. In their hunting cabin, Stan pulls out his revolver, and Axel makes a lewd comment about Stan's girlfriend. Stan becomes angry and threateningly points the gun at Axel. Mike enters the room and quickly disarms Stan, who insists the gun was empty. When Mike discovers it had been fully loaded, he empties all the rounds out of the gun except one. He spins the chamber, places the gun against Stan's head and pulls the trigger. The gun does not go off. He then leaves the cabin and throws the gun into the mountains. Mike later reunites with Stevie, who has lost his legs and is partially paralysed and recovering in hospital. Stevie reveals that someone in Saigon has been mailing large amounts of cash to him, which indicates that Nick is still alive, and playing Russian roulette. Mike travels to Saigon. With the help of the Frenchman Julién Grinda, he finds Nick in a crowded, loud roulette club, but Nick appears to have no recollection of his friends or his home in Pennsylvania. He is under the influence of heroin, evidenced by track marks on his forearm. Mike pays the club management to face Nick in the game. Mike plays Nick in a game because that is the only way he can talk to Nick without his words being drowned out by the gamblers. During the final match, Mike tries to persuade him to come home. Mike speaks of his and Nick's time together during their deer hunting trips. Mike reminds Nick of his deer hunting philosophy, which is to only take one shot. Nick finally smiles and acknowledges Mike by repeating the words "one shot." With that, Nick raises the gun and shoots himself in the head.